In 1869, a young mother living in Montreal, Québec, an accomplished artist married to a Hudson’s Bay Company officer, learned that her painting Canoes in a Fog, Lake Superior was accepted for the annual Royal Academy exhibition in London. One of the premier events of the London social season, it was the ultimate expression of the Victorian passion for art. Everyone attended; Queen Victoria visited the 1869 exhibition five times. Imagine yourself part of 1869 London society, entering the brand new galleries at Burlington House, and viewing landscapes of the English countryside, portraits of nobles or other important persons, scenes of hunting, horses, seascapes and sailing ships, or great military battles—and then seeing these three canoes paddled by exotically dressed voyageurs heading into Lake Superior’s misty unknown. It caused comment. The Prince of Wales (future Edward VII) liked this picture so much that he purchased a large drawing that hung at Marlborough House, no doubt as a reminder of the canoe fêtes during his 1860 official visit to Canada. He remembered meeting the artist, Frances Anne Hopkins, at a luncheon in his honor on Ile Dorval. The morning mist of Canoes in a Fog, Lake Superior may have seemed only romantic atmosphere to the London audiences, but Lake Superior travelers know it well, and it evokes a sensation of damp chill. This masterful style of composition, at once artistically appealing and totally accurate, is typical of Hopkins’ best work. Lake Superior’s fog has already blurred the two canoes ahead and even the bowman of the last canoe. Despite the potential danger this exact moment is beautiful, and British art fans no doubt longed to take Mrs. Hopkins’ seat in the canoe. Throughout her career, this was one of her most popular paintings and was soon available as an engraving. It is still sold in reproductions today. Frances Anne Hopkins exhibited thirteen times with the Royal Academy. Nearly all were canoe scenes, and nearly all have disappeared from public view today. For over fifty years she made a name for herself in London as an artist of Canadian Scenery. Her paintings were very popular in Britain, and available for purchase at galleries in Montreal, as well. 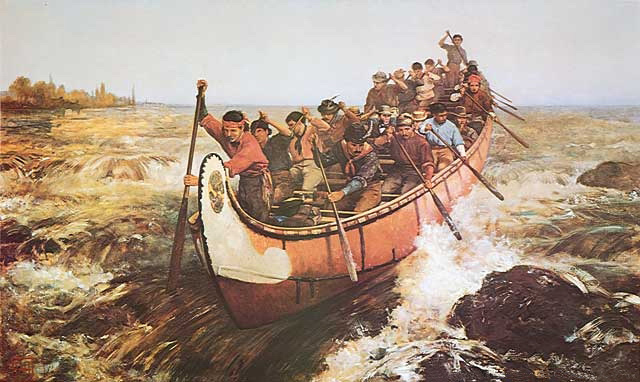 Fans of the voyageurs or of modern wilderness canoe trips, may assume that these paintings were produced, exhibited and sold in North America. In truth, they sold better in the more developed art market of London. Four of the five shown here, returned to Canada by mere chance in 1922. 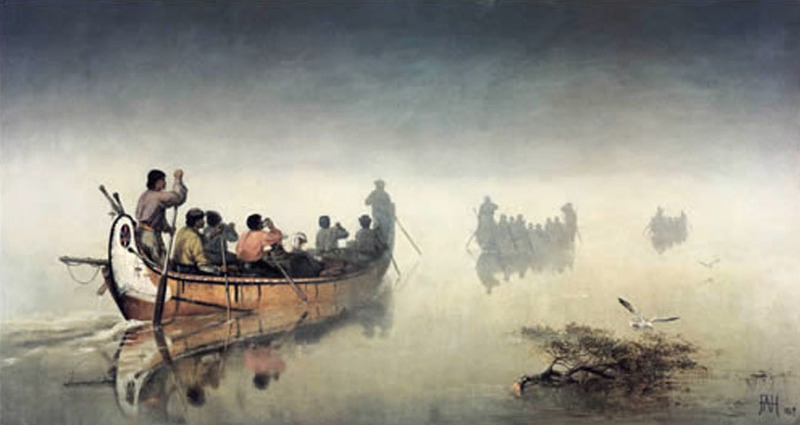 The fifth, Canoes in a Fog, Lake Superior, was acquired by the Glenbow Museum in 1955. Many Hopkins paintings remain in private collections in the UK, Canada, or the US. 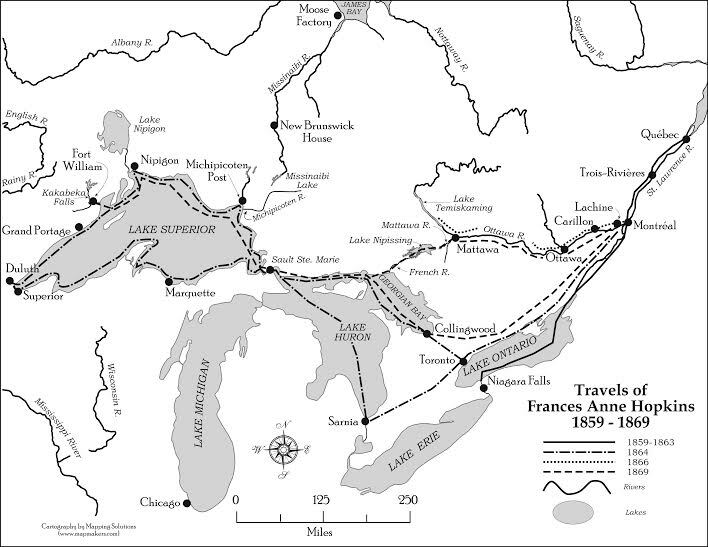 The Travels of Frances Anne Hopkins, 1859-1869. ©MaryEllen Weller Smith, 2014. The few Hopkins paintings on public display are prized by museums and historians for their accurate representation of the fur trade. That accuracy does not derive from multiple, yearly trips in birch-bark canoes as has often been claimed. The second wife of Edward Hopkins, —personal secretary to the Hudson’s Bay Company’s Sir George Simpson—she was stepmother to his three sons. From her arrival as a new bride in Lachine, Québec, in the fall of 1858 until January of 1863, she was almost continuously pregnant, a strong reason for not making a canoe trip to the interior of the continent. It wasn’t until 1864 that she finally accompanied Edward Hopkins on an inspection trip to Lake Superior, but they traveled mostly by steamer, with only a few weeks by canoe. She accompanied him to the Temiskaming district up the Ottawa River in 1866, and they returned one last time to Lake Superior in 1869. That is, she took a grand total of three long canoe trips. She sketched and painted (even in oils) all during her years in Canada, but nearly all her great oil paintings were created in her studio in Brunswick Mews off Upper Berkeley Street in London. This is where she had her sketches and watercolors from these trips, as well as canoes that had been shipped to London, access to her husband’s large collection of First Nations’ artifacts and clothing, and the expert counsel and advice of Edward Hopkins who had traveled at Simpson’s side in birch-bark canoes nearly every year from 1841 to 1859. 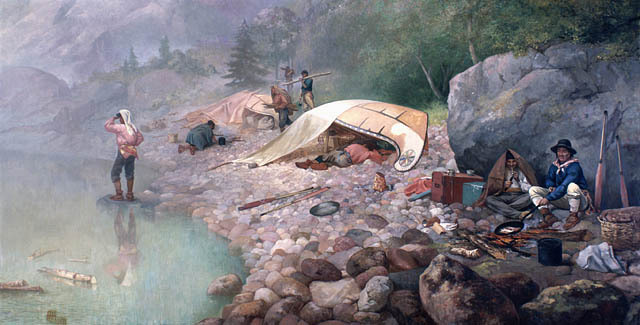 Canoes in a Fog, Lake Superior, Voyageurs at Dawn (1871) and Canoe Party around Campfire (undated) are all based on her personal canoe trips to the interior. The Wheel-star symbol favored by the Mohawks is on the bows of all these canoes, a sign of her strong attachment to her years in Lachine, where she repeatedly drew the Mohawk village of Caughnawaga (modern spelling is Khanawake) just across the St. Lawrence River. It was the home of Sir George Simpson’s select crew of voyageurs. Many years later she declared in a letter that this symbol was on all her canoes. Voyageurs at Dawn (1871), shows a camp in the early morning. Fur trade officers slept in proper tents, but the voyageurs leaned their overturned canoes on the gunwales, propped paddles and poles across the open side, and draped the sails and other covers over that structure to create an instant shelter. Equipment and baggage were tucked underneath. One man is shown sleeping-in, just to make the point. The scene is carefully constructed to display the maximum in equipment, tools and practices. 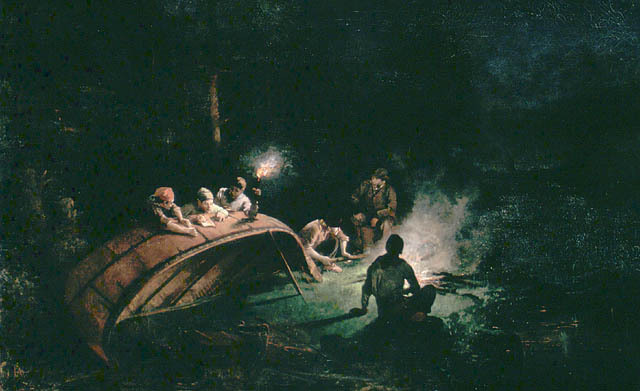 Canoe Party around Campfire (undated), a night-time scene, depicts the necessity to constantly inspect and repair the birch-bark. Since they often did not stop until nearly nightfall, this was indeed done by torch-light near a campfire. Every canoe carried extra rolls of bark, lengths of watape (spruce root) used for sewing, and bags of pine resin and pitch for sealing. Their lives depended on this inspection and repair. Shooting the Rapids (painted about 1879) is a souvenir of a July 1863 daytrip to run the Lachine Rapids, a must-do tourist experience. Sixteen voyageurs paddle this canoe de maître, but there is no cargo. This was a thrill-ride to impress the two male passengers on your left. Our viewpoint is so close to the canoe and the rushing waters, that we feel part of this scene. It has become the preferred illustration for nearly all publications related to canoes and the fur trade. Canoe Manned by Voyageurs Passing a Waterfall (1869) was, I believe, done on commission for the couple seated in the center of the canoe. Their identity is strongly debated among scholars. In the 1940s, staff at the National Archives of Canada believed they were Lord and Lady Monck shown on a canoe trip while he was Governor General of British North America (1861-1867) or of the Dominion of Canada (1867-1868). The prominent display of the Union Jack in the stern is consistent with that status, and there is something of flattery—even sycophantism—in this scene. Note the water-lily offered to the lady by the voyageur. 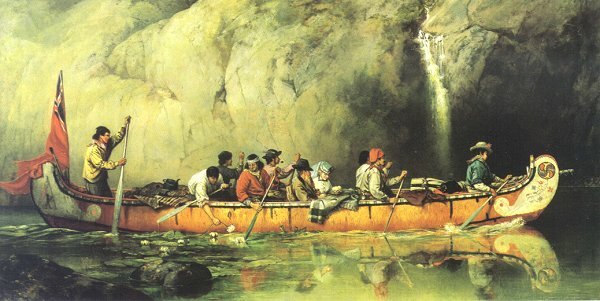 This also is the one and only Hopkins painting where the passengers are as prominent as the voyageurs. Frances Anne Beechey (Hopkins) had already exhibited in London before her marriage. She saw the opportunity to live, travel, and paint in Hudson’s Bay Company territory as both a personal adventure and a professional opportunity. Just as birch-bark canoes and voyageurs were disappearing from the scene, she sketched and painted those canoes, as well as the timber rafts floating down the St. Lawrence River outside her front door. A wife and mother as well as an artist, Lachine and Ile Dorval were especially dear to her. This is where she and her husband honeymooned and where her first three children were born. She lost both of her Canadian-born sons to childhood illnesses and they are buried in Montréal’s Mont Royal cemetery. Mrs. Hopkins returned to London with her stepsons, and her only surviving child—daughter Olive— where she continued her career, painting Canadian scenery. MaryEllen Weller-Smith taught French and Spanish for more than thirty years in Minnesota and is a longtime fan of Frances Anne Hopkins’ paintings. Her biography of Hopkins’ life takes a multi-cultural perspective, just as Hopkins’ art combines both the London art world and the North American fur trade. Publisher inquiries are welcome. Copyright © 2014 MaryEllen Weller-Smith. All Rights Reserved. The feature photograph Mrs. Edward (Frances Anne) Hopkins, artist, Montreal, QC by William Notman (1826-1891) 1863 is part of the McCord Museums collections and is used under a Creative Commons license. Article intéressant d’un cousin éloigné aussi un blogueur à ses heures. I missed that one Mike.